If she scales her semifinal hurdle and records a win in Saturday's final, Venus will replace Serena as the oldest women's grand slam winner. Venus Williams is soldering on at the 2017 Wimbledon tournament as she took a giant step into the semifinals on Tuesday. The 37-year old won a cross-generation battle when she beat 20-year-old French Open champion Jelena Ostapenko 6-3 7-5 on Tuesday to reach her 10th semi-final in 20 attempts at the All England Club. 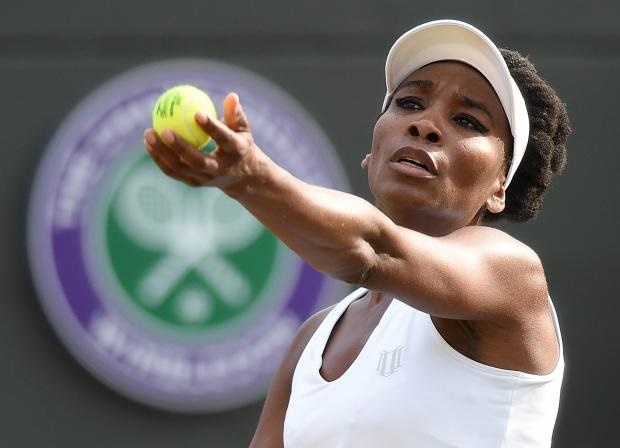 Venus who will now face home favourite Johanna Konta in the battle for a final spot said she is drawing on the emotional support of her absent sister Serena at Wimbledon. "They're definitely here with me, for sure," Williams told reporters on Tuesday. "Even if it's not physically. That is one thing I do know. They're fighting right alongside me." In a professional career lasting more than two decades, Williams is closing in on a 50th WTA title and credits her longevity to a love of the game and a desire to constantly improve. "I love it," Williams said. "I try really hard. There's no other explanation. You do your best while you can. That's what I'm doing. "I love the challenge. I love pressure. It's not always easy dealing with the pressure. There's constant pressure. It's only yourself who can have the answer for that. "I love the last day you play, you're still improving. It's not something that is stagnant. The competition keeps you growing. You have to get better if you want to stay relevant." The veteran last triumphed at Wimbledon in 2008, which remains her seventh and final grand slam singles title.